…with the National Art Education Association’s From Periphery to Center published just a few years ago, and decent coverage on the topic in journals like the Journal of Museum Education and occasional articles in Art Education magazine, the Journal of Aesthetic Education, etc. But Rika Burnham and Elliot Kai Kee’s contribution of Teaching in the Art Museum adds a wonderful update to what, in retrospect, feels like a tired collection of worn out advice for art museum teachers and tour guides. Most astonishing is Elliot Kai Kee’s chapter on the history of art museum education. In stark contrast to the quick glossing over of themes in our history that can be found in the aforementioned From Periphery to Center and in Museum Education: History, Theory and Practice (NAEA) published in 1989 but reads like a staid and blusterous history text book from the 1970s, Kai Kee has given us an immensely readable and often exciting account of our past. To help make it personal, he’s populated the chapter with quotes from both documents and people who have had a hand in shaping our history. Controversies over the years are well documented and fascinating to read about now that we have 20/20 hindsight. Docents and volunteers are major players in this account, as well they should be. They’ve been our partners from the beginning, and their presence here makes this the first book every art museum tour guide should read since The Good Guide (1985). In a particularly moving and inspirational chapter, Burnham writes about looking at Bellini’s San Giobbe Alterpiece in Venice, and what the rewards of sustained looking have to offer us. The goal of the book, summed up on its final page, is for art museum educators to redefine what many think of as visitors seeking information to visitors seeking experiences. The change, then, is within us. Visitors have always been experience seekers but our failure to recognize that is what has caused information overload in many cases. While this is not a new idea, Burnham is right to remind us again that information doesn’t equal experience, and it the latter that motivates our visitors to become devotees. But overall this book remains a great little book, and I’m not the only one who is a fan. 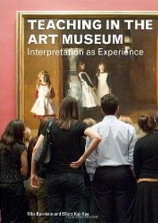 Teaching in the Art Museum was voted best museum education book of 2011 over at the Museum Education Monitor.